Building on the three season sunroom, the Model 400 Thermal Sunroom by Connor Windows Doors and Sunrooms takes you to a new level in comfort. By offering 3″ extruded insulated aluminum pillars and double glazed windows, this Thermal Sunroom allows you to extend your seasons enjoyment. 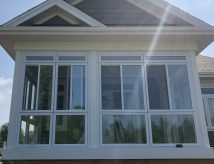 With a Connor Windows Doors and Sunrooms Thermal Sunroom you will adding a new high quality, customized and comfortable living space to your home or cottage. Every region of the country has their fair share of good and bad weather. Don’t let nature lock you inside, rather enjoy the seasons from the comfort of your new Sunroom. High density 3" foam panels keep this room warm and comfortable and the heavy gauge 3" aluminum extrusions offer strong support for wind and snow load. All extrusions have commercial grade thermal breaks reducing condensation and heat loss. All windows are high efficiency glass with Low-E Argon gas adding one more level of protection from the elements. Therma-Deck Our thermal poly deck system consists of panels with 3.5", 5.5" and 7.25" core of insulation sandwiched between two 1/2" Oriented Strand Boards giving our Therma-Deck a 25% better insulated rating than conventional flooring construction. Therma-Deck eliminates costly foundation work and finished surfaces can receive carpet, tile or almost any type of flooring.